Following system-wide student consultations, the Board of Regents (BOR) approved on Friday the admin-proposed revisions to the Socialized Tuition and Financial Assistance Program (STFAP) and the University Student Code, with seven out of nine present members voting yes to the reforms. According to Student Regent Krista Melgarejo, the BOR approved UP President Alfredo Pascual’s proposed Socialized Tuition Fee Scheme (STS), which seeks to streamline and automate the STFAP bracket assignment process. Melgarejo and Staff Regent Anna Razel Ramirez voted against the admin-proposed reforms, which will apply to incoming freshmen the following academic year. “Matagal na nating kinokontest itong STFAP. Pero sa kasamaang palad ay patuloy pa ring ino-optimize at mina-maximize ng administration yung isang scheme na nakita natin na history has shown na hindi naman nakakatulong sa mga estudyante (We have long contested the STFAP. Sadly, the administration continues to optimize and maximize a scheme which history has proven inefficient for the students),” Melgarejo said. The BOR also agreed to implement changes in articles 330, 430 and 431 of the University Student Code and to an increase in the laboratory fees of chemical engineering students. 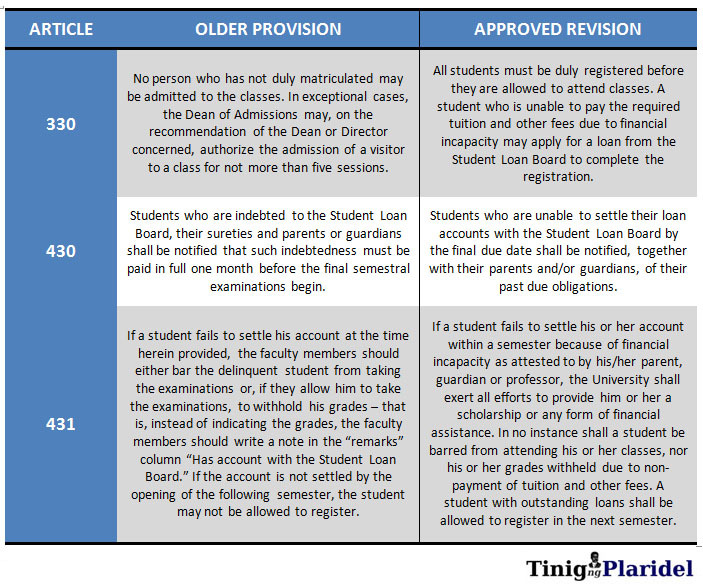 The BOR adopted Pascual’s version of Article 430 which stipulates zero interest in student loans settled within one semester, and Article 330 which requires students to register and pay tuition fees before they are allowed to enter classes. Among the nine members, Melgarejo solely opposed the revisions in Article 430 and 330. The board unanimously approved the Justice for Kristel Tejada (JFK) Alliance’s version of Article 431, which allows students with unpaid tuition fees to attend classes. Students with unsettled loans will also be allowed to register in the following semester. Kristel Tejada was a Behavioral Science freshman in UP Manila who took her own life in March allegedly due to her inability to pay her tuition loans. Though Melgarejo’s counterproposal was welcomed by the board, she said it was a minimal win for the students. Melgarejo said that for Pres. Pascual, the solution for financial incapacity is still tuition loans. “In essence, yung UP nakakalimutan niya na na yung edukasyon natin sa loob ng UP ay isang karapatan. Pero it seems that with the policies that are being approved right now, ‘yung karapatan ay kailangan mo nang bayaran (In essence, UP seems to overlook that UP education is a right. It now seems that with the policies that are being approved right now, you have to pay such right),” she said. Melgarejo added, however, that the administration is open to their proposal of rolling back tuition rates. Based on consultations, students have expressed dissent to the high tuition fees and are demanding for a new framework instead. “Hindi na siya [UP] yung ‘university of the people’ na nakilala natin. Ka-level niya na yung mga private universities ([UP] is no longer the ‘university of the people’ we knew. It is now in the same level with private universities),” Melgarejo said. Tinig ng Plaridel is currently gathering more information about this story. Updates will be posted soon.